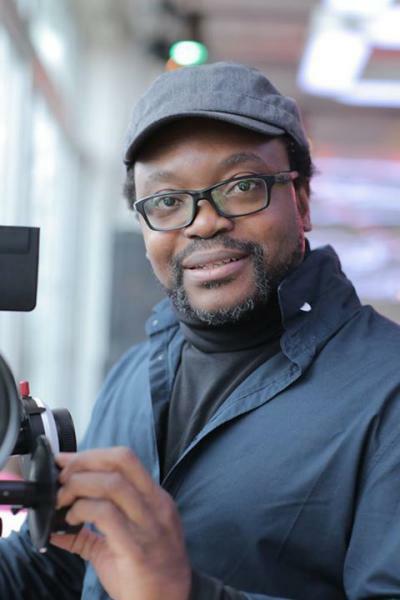 Jean-Pierre Bekolo is an avant-garde filmmaker whose imaginative work overturns stereotypes of Africa and African cinema. His entertaining films operate on multiple layers, engaging viewers with thrilling stories, biting humour and dramatic aesthetics. He was born June 8th, 1966 in Yaounde, he studied physics at University of Yaounde and Television production (editing) at Institute National de l'Audiovisuel - INA in Paris where he also studied semiotics under Christian Metz. An advocate of artistic freedom, Bekolo is committed to realising Africa's philosophies and cultures. Quartier Mozart shows the hybridity, complexity and humour in urban Yaounde in a playful, hip-hop reinvention of a traditional tale about gender, power, magic and politics. 1995 He directed Aristotle's Plot, the African entry in the British Film Institute's series of films commemorating the centenary of cinema that has included the participation of artists such as Scorsese, Bertolucci, Frears, Miller, Reitz, and Godard. Part action movie send-up, part parody of Aristotle's rules, part satire on Africa's preoccupation with itself, this first African film selected at Sundance shows Bekolo to be an "increasingly fearless trickster." Aristotle's Plot parodies rules and definitions, action movies and ‘African' cinema made for European audiences, while aesthetically reflecting on the nature of existence, its ambiguities and absence of rigid categories. 1996 Bekolo's work on the re-representation of Africa also includes insightful documentaries that seek to educate, such as Grandmother's Grammar on groundbreaking Senegalese filmmaker Djibril Diop Mambety. 2013 Banned in Cameroon in 2013, Jean-Pierre Bekolo's controversial film Le President (2015 AMAA Awards Best screenplay and Jury Special Prize) Aiming to incite viewers to conceive an alternate reality, his fake documentary The President is a hilarious, biting satire on African leaders who cling to power. 2015 Les Choses et Les Mots de Mudimbe on the renowned Congolese philosopher, multi-linguist and uber-polymath. This 4 hours documentary was part of the official selection of the 2015 Berlinale. "An unusual film, as fascinating as its object/subject, opulent, sensitive, clever, and radical. Another station of delightful postcolonial, cosmopolitan filmmaking". Le documentaire du réalisateur belge Thierry Michel - qui revient sur l'assassinat d'un militant congolais des droits de l'homme - devait être diffusé au festival Écrans noirs à Yaoundé. "Le cinéma africain n'est pas encore né"
"African filmmakers should define cinema for Africa"
2e édition - plusieurs films africains au programme dans le cadre d'une journée consacrée à l'entrecroisement entre Queer & Post-colonialisme le 17 ainsi qu'un film le 18. Sur une idée originale de la cinéaste Claire Denis. Cette exposition permet de découvrir des oeuvres conçues pour l'exposition qui incarnent chacune à leur manière l'apport de la diaspora africaine dans les mondes qui l'ont reçu. L'ASPA en collaboration avec le DESC et Nabrabogo, 3 associations de Sciences Po, font rayonner l'Afrique à Sciences Po en organisant la Semaine Africaine. Moment de découverte culturelle, moment de communion avec cette partie de la planète! Venez rencontrer nos auteurs en dédicace! 2ème édition. Thème : "Voix et Visions de Femmes (Women's Voices and Visions)"
de Jean-Pierre Bekolo. On commence exceptionnellement à 16heures. Projection suivie de débat. on 15 April, 7pm. At the Warehouse Theatre. Entrance Free. A 20h00. En présence du réalisateur camerounais. Africiné est partenaire de l'évènement organisé par AfricAvenir. Screening followed by a discussion with director Jean-Pierre Bekolo as well as a small reception in the foyer. Jean-Pierre Bekolo présente son film "Les Saignantes"